Sergey Kovalev stops Jean Pascal in Round 8. Unified light heavyweight titleholder Sergey "Krusher" Kovalev did what he does best on Saturday night -- score a knockout. Kovalev, in the toughest fight of his professional career, dropped former world champion Jean Pascal for the first time in his career in the third round, and then stopped him with two clean right hands to the head in the eighth round as he retained his three 175-pound world title belts on Saturday night at the Bell Centre in Montreal, leaving Pascal's hometown fans disappointed and his young daughter, Angel, in tears at ringside. It was a fierce battle worthy of early fight of the year contention as they pounded each other with abandon, but it was Kovalev, coming through some rocky moments, who stopped Pascal. "How I started I didn't like," Kovalev said. "But after the fourth round I got control of Jean and what you saw -- I got him with a good right hand and he lost." Kovalev (27-0-1, 24 KOs), who was making his fifth title defense, was following up on his masterpiece in November, when he dropped and shut out ring legend Bernard Hopkins to take Hopkins' two world title belts and unify them with his own. It was the first time Kovalev had gone past eight rounds, and he didn't need to go beyond that point again with Pascal (29-3-1, 17 KOs), who viewed himself as Rocky coming into the fight because he was the underdog. He was bitterly disappointed by what he thought was an unfair stoppage by referee Luis Pabon, and called for a rematch. "It was a good fight for the fans, an action fight. I did my best," Pascal said. "I don't want to take anything away from Kovalev. He's a great champion but that was a bulls--- stoppage because I was still in the fight. That was a tough fight for both of us, and I don't know why the referee just stopped the fight. It's not hockey. "I was in the fight from the first round. I'm sure that I gave him his toughest fight. We should do it again. We should have a rematch." Said Kovalev, "I'm ready for any fight. If my promoter Kathy Duva of Main Events says I need to fight Jean Pascal again, I am ready." The fight began fast with the 31-year-old Kovalev, who is from Russia and living in Los Angeles with his wife and newborn son, going right at Pascal. Pascal stood his ground and landed a hard left hook in the second round, but Kovalev did not budge. Kovalev targeted Pascal's chest with his jab and then rocked Pascal with a right hand. Later in the round, Pabon warned Pascal for landing a low blow. Pascal landed some clean shots in the third round, but Kovalev took the blows and nailed him with a left hook that had him rocked and on the verge of going down. Moments before the third round ended, Kovalev knocked Pascal down for the first time in his career, crushing him with a clean right hand that left him draped over the ropes and Pabon correctly ruling it a knockdown. 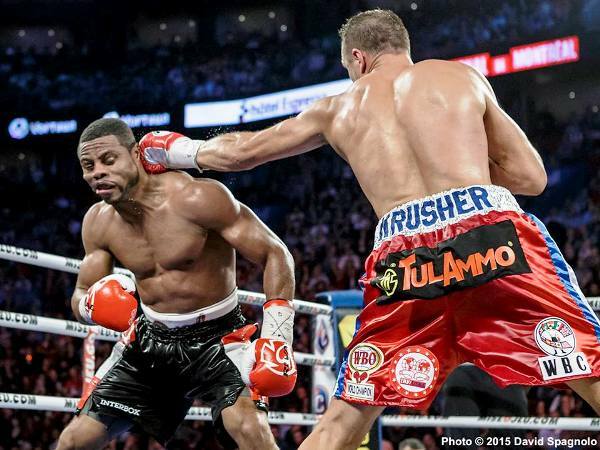 Kovalev came out firing in the fourth round against Pascal, who was still not recovered from the knockdown. It was target practice as Pascal was getting nailed repeatedly. But Pascal kept himself together and landed enough shots, including two hard right hands to the head, to stay in the fight. "He hurt me with a couple of good punches but I never lost control," Kovalev said. "I kept my mind in control and I did my job. It's boxing." Pascal, 32, who held a world title from 2009 to 2011 and was the lineal champion, had taken enough punishment in the third round that his daughter was escorted out of the arena before returning after the fourth round. Pascal had Kovalev a bit on his heels in the fifth round as he landed damaging right hands and forced him to tie up as he landed 12 of 20 power shots in the round, according to CompuBox statistics. Pascal's right eye began to swell in the sixth round but he continued to land right hands and had Kovalev looking uneasy. Kovalev blasted Pascal into the ropes with a series of punches early in the eighth round and looked like he was about to stop him, but Kovalev slipped on the mat. It gave Pascal a brief reprieve as Pabon had to take time to wipe off Kovalev's gloves as he got up. But as soon as the fight resumed, Kovalev nailed Pascal with two flush right hands to the head and Pabon jumped in to wave off the fight at 1 minute, 3 seconds. Kovalev was leading 68-64 on all three judges' scorecards at the time of the stoppage. "This is the sport of boxing, to get some and to give some. I was still in the fight," Pascal said. "I was not on the canvas. I was there. I was watching his punches. I feel the referee was waiting for that moment to stop the fight. "I'm a crowd-pleaser with a belt, without a belt. I am always going to give the fans a great fight because I am a warrior. I'm a true champion. I'll be back, don't worry." According to CompuBox, Kovalev landed 122 of 471 punches (26 percent) and Pascal was limited to connecting on 68 of 200 (34 percent). While Kovalev now owes a mandatory title shot to Nadjib Mohammedi (37-3, 23 KOs), 30, of France, who stopped Lee Campbell in the sixth round on the undercard, the big fight in the division is Kovalev against lineal champion Adonis Stevenson of Montreal, who was ringside. Stevenson bailed on a deal to fight Kovalev last year, supposedly to face Hopkins instead. But Stevenson failed to make that fight also, and has been facing second-rate opponents. However, he holds the WBC belt and the organization, in an unusual move, sanctioned Kovalev-Pascal as an eliminator to become Stevenson's mandatory, even though organizations do not rank titleholders from other organizations. So it is possible that later this year Stevenson-Kovalev could be made if both fighters want to hold onto their sanctioning body belts. It is a fight Kovalev has always wanted, even though many have been skeptical of Stevenson's true interest in the bout, despite his claim that he is.